BEST of BIKE is a fair for bikes and accessories. The event started in 2012 and took place annually in Salzburg, Austria. The last one was between 14 and 16 Sep 2014. Edition 2015 was cancelled. 2014 ‘ s, 56th edition of the annual “International CRAFTS Fair” in Zagreb, Croatia also known as “Međunarodni Sajam OBRTNIŠTVA”, was cancelled. The show started in 1959 and last edition was from 9 April till 13 April 2013. Cancellation of editions planned for September 2014 of three co-located events Intermopro, Intercool and Intermeat was announced in April 2014. The events took place for the last time from 23rd till 25th of September 2012. First, in 1990, was Intermopro (International Trade Fair for Dairy Products). Intercool (International Trade Fair for Frozen Food and Ice ) followed in 1994. Two years later in 1996, was launched Intermeat (International Trade Fair for Meat and Sausages). Host city was Dusseldorf. Another Dusseldorf fair – IMA – International Trade Fair for Amusement and Vending Machines, was cancelled in June 2014, 6 months before start of edition scheduled for mid January 2015 . IMA started in 1978 on annual frequency. Last edition was 14.01.2014 – 17.01.2014. After 10 years of operation of the Italian Real Estate expo – EIRE, its cancellation was announced on the last day of September 2014. The event was annual and took place for the last time between 24th and 26th of June 2014 at Fiera Milano City. Chillventa Rossija is an International Trade Fair for Refrigeration, Air Conditioning, Ventilation, which started in Moscow in 2011. The 5th edition of the show, planned for 2015, was cancelled with a promise to go back in 2016. The last event was on 4th, 5th and 6th Feb 2014. 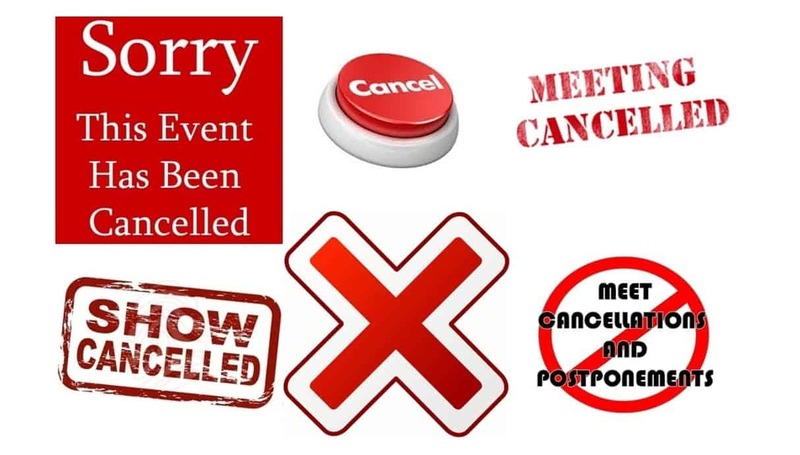 The Food & Drink Expo FOODREX 2015 was cancelled due to technical reasons. The official announcement claims there is a possibility of return in 2016. The fair ran yearly since 2011 in Belgrade, Serbia where also called “Sajam HRANE I PIĆA”. Last edition was in April 15-17, 2014. SALON du CHOCOLAT, which takes place in around 20 cities, announced that its Zurich edition for 2015 will be cancelled. The Zurich version had three issues since 2012. The last one from 4th till 6th April 2014. The International Agriculture and Agricultural Mechanization Fair – AGRO EURASIA or AVRASYA TARIM for 2015 was cancelled. It is an event that started in 2006 in Turkey, Istanbul. Its web page promises a 2016 return.